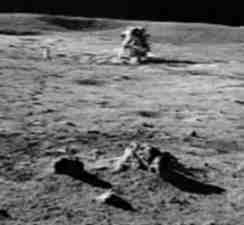 FOX Television advanced the claim that NASA's Apollo Moon missions were a hoax largely because Apollo photos contain alleged anomalies. David Percy, an Associate of the Royal Photographic Society, told FOX: "Our research suggests that images of the Apollo landings are not a true and accurate record. 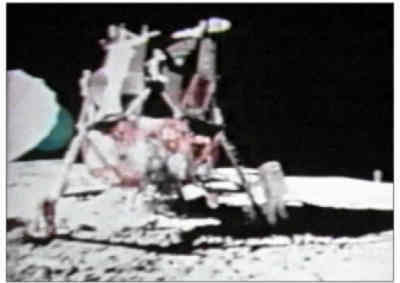 In our view the Apollo pictures were faked. Many of the images are replete with inconsistencies and anomalies." Are Percy and other Apollo deniers correct? Let's examine their claims. FOX narrator: "On the Moon, the astronaut's only source of light was the Sun. ... Here's an astronaut who descends into the huge shadow cast from the lunar module, yet his entire body is still visible. How is it that he is not shrouded in darkness?" Apollo critic answers: "It's because there's more than one light source, which means they're not on the Moon." Question: why is the astronaut in the shadow illuminated? Test: surface reflection illuminates toy astronaut in shadow. In second image, foreground reflection is reduced with black paper. The side-by-side photos show a test I conducted with a toy lunar module and astronaut placed in its shadow as in the Apollo image above. The two photos show the difference between a reflective gray-paper foreground and a less reflective black-paper foreground. Foreground reflectance from the powerful lamp above was sufficient to illuminate the toy astronaut in the shadow of the toy lunar module. 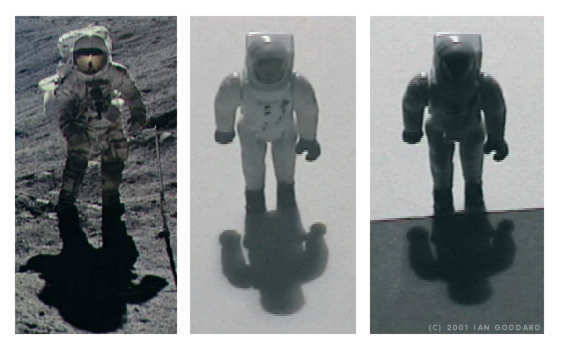 This simple test demonstrates that Apollo astronauts illuminated in shadow are not an "anomaly" but a predictable result of sunlight reflecting off the lunar surface. Illumination of Apollo astronaut on left simulates surface reflection on toy. FOX narrator: "On the Moon, the astronaut's only source of light was the Sun. Yet in this photograph from Apollo 14, the shadows are cast in different directions suggesting multiple light sources." Dave Percy: "The shadows cast by the rocks in the foreground should have been east-west like the LEM [lunar module] shadow." Test: slanted surface alters shadow direction on Moon-rock model under one light. Identical ground slant can be detected in Moon photo on left. Other examples in Apollo photos of shadows following ground slant. On left shadows run down crater. On right run down Hadley Rille. Just as the shadows follow the topography of the lunar ground in these two examples, the alleged shadow "anomaly" in the previous Apollo photo is clearly a result of ground slant and therefore is not a genuine anomaly indicating fakery. Apollo critics cite other examples of shadow-direction "anomalies," all of those I've viewed are obviously a result of irregular ground slant. FOX Narrator: "These two photos seem to have the same mountain backdrop, yet the lunar module is only visible in one of them. 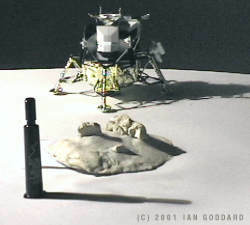 Seemingly impossible since the LEM never moved, and its based remained even after the mission. Some suggest the same artificial backdrop was used when shooting two entirely separate pictures." 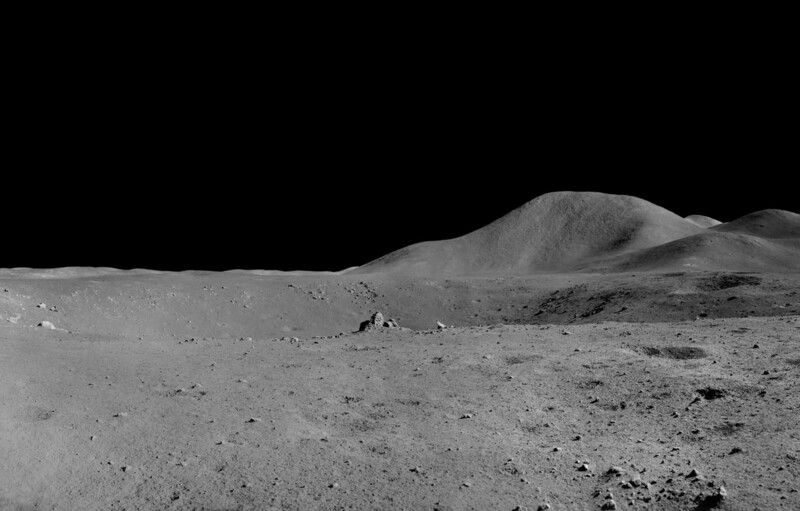 Examination of Apollo-15 photos clearly proves that the mountains in the background are so large and distant that they can be seen without changing their appearance from myriad points of view with or without the LEM in the foreground. The mountains above are the Apennine Front on the left and Mount Hadley Delta on the right of each photo. The astronauts went up to those mountains and walked on Hadley Delta. How could they walk into a fake backdrop? 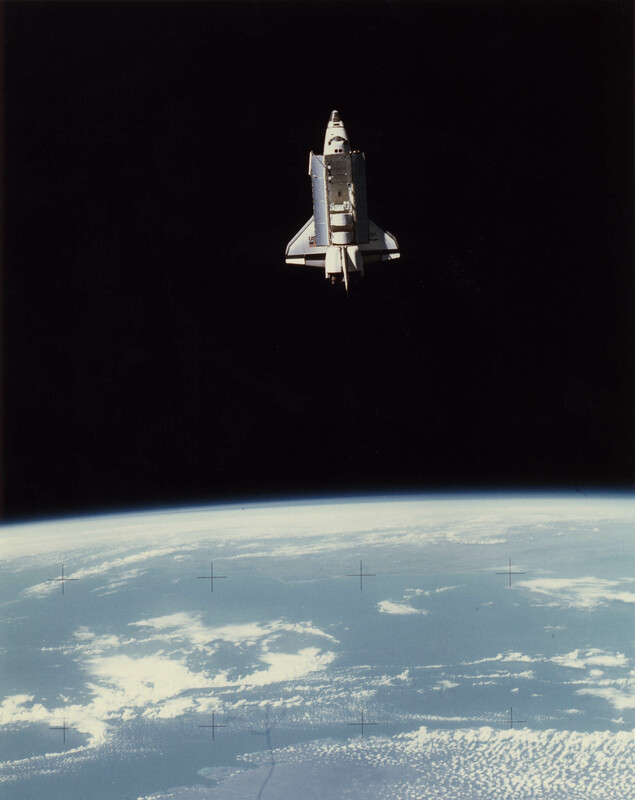 This panorama, a composite of single photos, shows that theApennine Front and Hadley Delta can be viewed without the LEM in the foreground, since when the camera views them at 180 degrees (as marked below the panorama), the LEM is behind the camera at 0 degrees, out of the picture frame for that photo. The panorama also gives a sense of how far away the mountains are. Because there is no atmosphere on the Moon, objects do not fade over distance and thus distant mountains can appear very close, as they do in the two photos FOX showed. Question: why do crosshairs vanish over sunlit white objects? Answer: strong luminosity can washout thin lines. Test: hair across lens is washed out by sunlit white paper. With no atmosphere on the Moon, sunlight is stronger. None of the alleged photographic anomalies presented by FOX TV are true anomalies and thus they evidence neither manipulation nor a hoax. In the future Goddard's Journal shall examine alleged physical anomalies said to be evidence that man never set foot on the Moon. FOX Television Network: Conspiracy Theory: Did We Land on The Moon? February 15, 2001. Fortean Times: Percy and the Astro-Nots. 1997. Apollo 15 Digital Picture Library & JSC Digital Image Collection. Apollo Lunar Surface Journal. Thanks to David Harland, Mike Constantine, and Dave Byrne who assembled the Apollo-15 panoramas and to Ken Glover who helped me update links to them. BadAstronomy: Fox TV and the Apollo Moon Hoax. 02/12/2001. Thanks to Michael de Kooter for finding this crosshair-knockout example. Article published in English on: 29-11-2012.